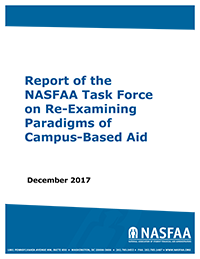 NASFAA convened the Re-Examining Paradigms of Campus-Based Aid task force over the summer of 2017 in response to growing interest in a “one grant, one loan model” for federal student aid. Considering other implications of a “one grant/one loan/one campus-based” model, such as consumer information and loan servicing. In its deliberations, the task force developed two viable models that fell within the scope of their work. Ultimately, the group saw merit in each approach, and chose to include both in the final report without a recommendation favoring over the other. Both models share a vision for the same single loan program, with higher annual and aggregate limits to account for the loss of Perkins loans, institutional authority to limit loans for certain categories of students, and limiting the loan subsidy to Pell Grant-eligible students. In the first model, the group stressed portability as its major advantage. Citing flaws in campus-based allocation formula that result in similarly-situated students receiving certain types of aid at one school and not another, the portable model proposed by the task force features early notification of eligibility for the single federal loan program, a single federal grant program, and work study, with eligibility fully transferable across all eligible institutions. The second model stresses institutional flexibility as its highlight, and more closely resembles the existing campus-based aid programs. It features a revised allocation formula to distribute a “Pell Plus” grant award that institutions could award at their discretion. Federal Work Study under this model would remain largely unchanged, but with added institutional flexibility to transfer funds between campus-based programs. The task force finalized its work in the fall of 2017. Several major events took place during its progress and after its completion, including the expiration of authority to lend under the federal Perkins loan program and the December introduction of the PROSPER Act, which created a one grant/one loan model, while preserving Federal Work Study for undergraduate students. The introduction of the PROSPER Act is the first of many steps that need to occur in the legislative process before the final reauthorization occurs. It is the task force’s hope that this report will guide future progress on reauthorization of the Higher Education Act.